The night we lost our first relic I didn't log on until it was almost over. With NF having just been released I had spent the night upgrading the RS UI skin, unaware of what was happening in our frontier. When I did eventually log in I was told to get my arse to Svasud Faste asap as we were under a CTA. Sure enough the Albs had taken the last keep needed to open the gates and were making their way towards the relic. When I got to the relic temple I was pleased to see that there was a large number of RS members there despite the late hour. We of course lost the relic in the end due to the overwhelming numbers of Albion's. It was inevitable it would happen, it had happened on almost every other server in the world. The second relic was lost later that week on the saturday morning. RS had organised a POC raid and we had 3 and a half full groups participating. Being a weekend the Albion's had gathered larger than usual numbers and so I was keeping a close eye on the situation. At one point it was announced by a level 20 player that Ardamel had issued a Realm CTA! I cancelled the CTA as usual and pointed out that Ardamel had no authority to issue such a command and that only RSA GM's could issue RSA CTA's. Ignoring the fact that LFoM had once again overstepped the mark it really annoyed me that they were now switching tack and bullying our lower level members, members who probably didn't even know what was going on or know the background. I felt quite sorry for the guy who had me countermand his announcement, he probably thought he was doing the right thing by passing on the message. A CTA was eventually announced by another GM in the RSA. I was waiting for one of the towers to be attacked before issuing a CTA but the decision was taken out of my hands. I know the GM that issued the CTA was put under a lot of pressure and eventually gave in. The 3.5fg of RS from the POC dungeon joined the defence battle group (which was currently being lead by a RS member anyway) and went to defend the keep. We were joined by various other groups from the RSA. By sheer weight of numbers the Albion's once again took the final keep needed to open the last relic gate and all the Mid's regrouped at the now open relic gate for one last stand. Looking around it was clear the RS had the largest number of members present at the last stand but more importantly there seemed to be a distinct lack of the people from the larger guilds. Out of curiosity I did a /who modernagrav search. To my surprise I found that people were in fact powerlevelling alt's there and more amazingly was the fact that no less than 50% of them were from the Realm Defenders guild! This was Rauthians guild! There he was lecturing us over public and private forums and yet at the last stand it's his guild that's not attending not RS. Now let me make one thing perfectly clear about the week we lost the relics. Neither Ardamel, Rauthian, Ladonna or any other realm defence leader asked me for the help of the RSA. I didn't receive a pm from any of them. Don't get me wrong I received plenty of pm's from their underlings telling me how crap RSA was etc but not once were we ever asked for our help. It seems they wouldn't stoop to asking for help and I wouldn't be bullied into doing what they told me (made even worse through the fact that they were issuing commands to the RSA but refusing to talk to it's leaders). It could be argued that leaders of all the alliances were in the wrong and should of backed down. Who was to blame the most? Whats it matter? We had lost the relics. My personal feelings is that there was an awful lot of LFoM and WR members not answering their CTA, there was also a lot of the self proclaimed elite guild groups that didn't turn up to the defence. RSA was an easy target to turn their anger and disappointment on (conveniently overlooking the fact that RS had more members defending every night than the majority of guilds) and definitely easier than admitting that our leaders on the night weren't good enough or even that the Albions played better and basically just beat us fair and square. After things had settled down in NF, WoW was released. A lot of DaoC players, disillusioned with the game, left to try pastures new. Midgard was especially badly hit. We were not only losing players because WoW seemed a more fun game, but because people didn't want to play for a underpowered realm (lets not forget at this point NF offered nothing to tank classes apart from the guarantee of being allowed to sit inside/outside towers/keeps for hours on end whilst the ranged classes had all the fun) and, probably the biggest factor, was the way that the Midgard realm had fractured itself. Both the 2 largest alliances were hemorrhaging members at an alarming rate. Also unbeknown to me at the time there was people behind the scenes in LFoM still doing their best to poison relationships between LFoM, WR and RSA. Seeing that both the LFoM and the WR alliances were suffering Ardamel came up with an idea which would partly involve the RSA. His idea was to create a 'super alliance' which would, in his own words, incorporate all the important realm defence guilds. The guilds that didn't gain access would be allowed to join the RSA or the LFoM alt's alliance. To make this plan obviously RSA would need to be consulted and for the first time ever LFoM contacted the leaders of RSA and invited us to join in their discussions on the LFoM alliance leaders forum. I have to admit that the breaking up of the WR alliance worried me greatly on 2 counts. 1) - Of the 2 big alliances I saw them as being the ones that I would prefer to become the dominant alliance. This was partly because of the way that they seemed to approach most things, i.e. 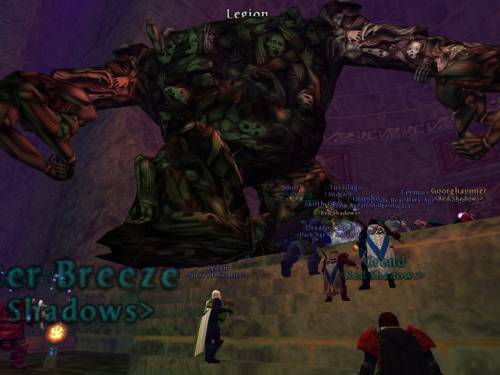 other guilds/alliances, with a greater maturity and respect that was all too often found wanting within the LFoM alliance. 2) - I didn't want the RSA getting swamped with 'old school' guilds who would immediately start trying to police the /as channels. The other worry was again that it seemed as though LFoM were trying to tell everyone in the realm what to do, what alliances they were allowed to play in etc. My first post (which can be seen at the end of this document) firstly gave them a brief RS-LFoM history to clear up any bad PR I knew we were getting and secondly to state that the RSA would not get into a discussion were me and Ardamel decided which guild went into which alliance. I wanted to distance us from this as, in my opinion, I didn't have the right to decide another guilds fate. I clearly stated that WR and LFoM should decide who was joining LFoM in their merger. Any guild that was left out would be welcome to apply to become members of the RSA but would not gain automatic admission. [18:06:56] @@[BattleGroup] Ardmeth: "The suggestion is that 7 of the greatest guilds in WR or particulary important guilds will join the FoM alliance. there are many completely dead guilds in the WR"
[18:15:45] @@[BattleGroup] Ardmeth: "guilds currently in WR alliance will join either FOM alliance or the RS alliance (only a very few guilds)"
So basically if your not one of the 7 then your not one of the greatest guilds or a particularly important guild? This comment didn't bother me too much as anyone who got pissed at these comments would only get angry at LFoM. I warned him about making separatist comments such as these but it seems he didn't listen. The second comment was way out of line though. I had made it perfectly clear we wouldn't automatically take in all the rejects, they had to prove to us that they were capable of working within the RSA. If we turned down any guilds now they would be quite rightly be angry at both RS and LFoM through no fault of our own. I was not chuffed with that statement at all. [18:27:36] @@[BattleGroup] Ruathan: "one question for rs tho espcialy after what thay did last time"
[18:28:21] @@[BattleGroup] Ruathan: "if once we have relics back in mid hands will rs alliance follow fom when thay issue a cta ( we got new strick rules() oor will thay wait 4 hours agasin"
I really, really, really wish I had been there when he had said that. The fact that the new LFoM 'strick rules' were carbon copies of the ones we used during the time we lost the relics it would of allowed me to issue the following. RSA will never allow LFoM, or any other alliance, to dictate our CTA policy. Having said that, now that LFoM are using an identicle protocol for issueing CTA's as us it seems very likely that we would be issuing them at the same time. Now 2 questions to you Rauthian. 1) Now that your using the same protocol as RSA do you now admit that your old protocol was wrong and that we were in fact right? As even you have to admit that logic dictates that if your new protocol is the correct one then so is our old one (which you have copied). 2) if so, are you willing to apologise for not only all the crap you gave us at the time but also the misinformation and the poisoning of the waters your continuing to do to this very day? Unfortunately I wasn't there and I wasn't able to confront him, but to be honest I think his rants had lost him the respect of even the most stalwart LFoM GM's a long time ago. Once again Rauthian (registered as raithian on LFoM leaders boards) making up stats to further his plans to drive a wedge between LFoM and RSA. RS had the largest turnout of guild members at the relic keep's defence. This was taken from the alliance leaders forum in the thread discussing the merging of LFoM and WR.